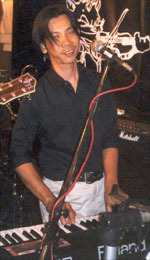 Oat is a well known musician and classical Thai music teacher in Bangkok, his resume was impressive and during his audition, Oat managed to recreate the same Celtic sound the band had in Canada. He instantly became a member of LA9. His talent on the keyboard brings yet another vital sound to Life After 9. His ability to create a multitude of sounds on the keys provides a distinct component to the current music of the band. Oat composes all of LA9's Thai songs, including "Kratai Kap Tao" on the CD. These compositions combine an Asian quality with the band's Celtic rock sound. Oat is also a talented vocalist, his harmony and high backup vocals always evoke an enthusiastic response from the crowd.